The Patch King is hard at work on our first collection of sounds for the new Korg M3 series. 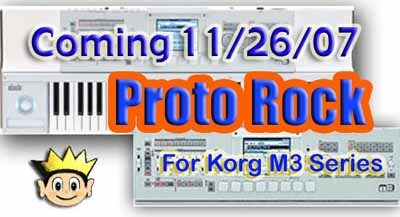 “Proto Rock” will contain 64 new programs and 64 new combis for the Korg M3 and M3m sampling workstations. It will also include several new multi samples and will be available “Fall 2007”. Korg has really hit a home run with this new instrument. They have added everything that was missing in the Triton and Karma and put it all together in a sweet package that is sure to do very well with pro musicians and weekend warriors alike. The editing software included with the M3 is a pleasure to work with. It’s all laid out very well and makes it really easy to bring your ideas to life. The 64 megs of RAM included is a great starting point for adding your own multi samples and the Radius board option is simply amazing! Hook a microphone up and you will have hours of fun playing with vocoder effect included. The new multi effect section has also been drastically improved with some great new effects like a sweet “Tube Preamp” and “Mastering” effect. We are looking forward to producing a large library of sounds for this amazing new instrument. If you have any suggestions as to what you would like us to develop please contact us and let us know.